BET announced four new late-night shows and a new prime-time miniseries about the life of Bobby Brown, reemphasized its position at the center of African-American culture. The network revealed a number of new initiatives to kick off its upfront sales efforts Thursday night in New York. In the coming year, BET’s production plans will amount to “47% more original programming hours this year than last year,” she said. For its new foray into late-night TV, BET has formed partnerships with a number of top talents, including Chris Rock, Wanda Sykes, Steve Harvey and 50 Cent. All four are credited as executive producers on new shows. Rock is producing “The Rundown With Robin Thede,” a weekly show in which Thede, formerly head writer on Comedy Central’s “Nightly Show with Larry Wilmore,” will riff on the week’s headlines. Harvey is behind “BET’s Mancave,” which will have a panel of African-American men speaking candidly about women and other topics. Sykes is producing “Face Value,” a game show in which contestants will try and guess facts about ordinary people, based on how they look. Rapper 50 Cent’s show is called “50 Central.” On stage at the upfront, he described it as a variety show with an emphasis on sketch comedy. Other new shows announced at the BET upfront were “The Bobby Brown Story,” a four-part prime-time miniseries about the R&B star; “Divorce Saved My Marriage,” a scripted comedy series from comedian Kevin Hart; and “Love Room,” an unscripted series in which couples will move in together at the outset of their relationships to determine if they are compatible. 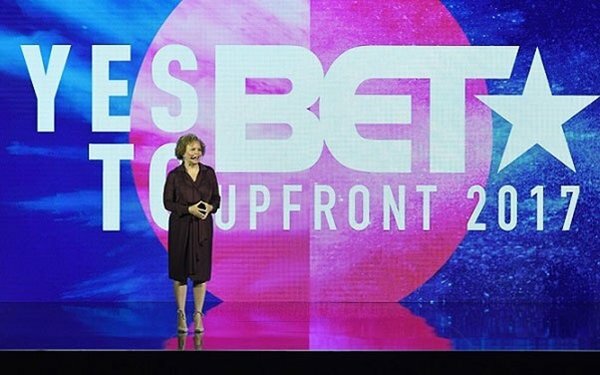 BET executives also announced BET’s other network, Centric – aimed at African-American women – will be rebranded in June to BET her. In addition, BET announced a landmark study of the way African-Americans use Twitter — a diverse community often referred to as Black Twitter. BET’s analysis of Black Twitter is being produced in partnership with Twitter, BET officials said. “Early data continues to support a strong correlation between Tweeting and watching live TV at home via traditional delivery methods,” BET said. “People on Twitter see TV as a social opportunity and source of information for what's happening, [what’s] best enjoyed live and [what’s] viewed with others on Twitter. The study’s findings will be released in June.